Online eye tracking without special hardware – easy, fast, and scalable. How can online eye tracking help me? Why do my visitors leave my website? What should I change to reduce my bounce rate? How can I improve my A/B tests? Which elements should I test next? Which design leads to the most customer engagement? Do I successfully convey my message? Do customers recognize/see my brand? Whether for usability and user experience tests of websites, gathering consumer insights in marketing campaigns, in market research or academical research – level up your studies with online eye tracking tests by Eyezag. For easy, fast, and scalable perception studies. For many years now, Eyezag is developing image processing and machine learning algorithms to determine gaze paths with standard webcams. Abandon short-lived expensive hardware and the cost of a laboratory. Instead, you can use our algorithm in the cloud which is always up-to-date. Eye tracking without device! Whether you want to test on a group of ten or a thousand people, in-house or internationally, for fast pretests or global campaigns – you enjoy the full flexibility. Save cumbersome experimental set-ups and let your users simultaneously participate in your studies through the world wide web – from anywhere and anytime. A high sample size gives you statistically backed evidence. Furthermore, any effects due to a foreign environment, observation of a participant or unacquainted hardware are minimized. 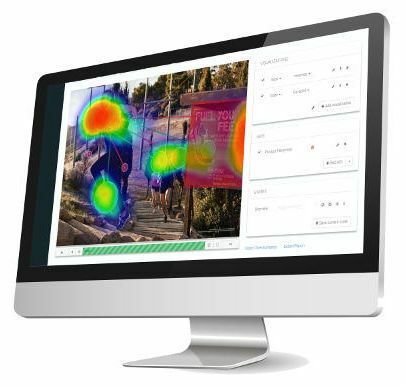 Use our online eye tracking software to easily create, conduct, and analyze your studies. You can start today! Let our trained market researchers and certified usability professionals do the field work for you. Our experts work out a study according to your needs and preferences. We take care about the participants, assure a high quality, and monitor your study till the end. We present you the interpretation of the eye tracking data and give actionable insights and recommendations for your product. Eyezag’s eye tracking tool is the optimal addition to our classical advertisement tests. The project and collaboration with Eyezag was fast, accurate, and straightforward. Eyezag’s eye tracking technology allowed us to gain a new level of understanding about consumers’ behaviors than we had previously achieved. In addition, the ability for consumers to participate from their own homes saves on the cost and shortens the timing of projects. Get inspired by our use cases and success stories! For the last 6 years we devoted ourselves academically and professionally to intuitive human-computer-interaction. Our research at the Karlsruhe Institute of Technology lead to the spin-off Eyezag: We combined state-of-the-art image processing and web technologies to create a novel application in order to collect and analyze a person’s attention on a computer and smartphone. During the years Eyezag’s technology was used globally for market research, UX testing and many more areas of applications. We are more than happy that thereby we contributed to making digital content more intelligible, usable, and accessible. Now, it’s time for us to meet new challenges. As a result, we decided not to take any new customers. Our sincere thanks goes to everyone that was part of our journey. We’re looking forward to meet again!